Sweet Creations is the original creator of Sweet Trees, sweet sushi and outrageous sweet creations. In 2009 Sweet Creations brought sweet trees to the market with great success in the United Kingdom. We now have offices in Greater London and New York. Sweet trees are also known as Candy trees which are a speciality of Sweet Creations. We have been highly praised for our quality and unique expertise in design of sweet trees, we use a very large variety of old fashioned sweets that everyone loves, as well as your favourites including Chupa Chups, Flying Saucers filled with fizzy sherbet, ABC Candy, Liquorice allsorts, Haribo, shrimps, millions, bubble gum, & jelly bean sweet trees. We also use a large variety of American candy, with the popular sour patches, nerds and Swedish Fish etc. Sweet creations use a large variety of Chocolate with all you favourites including Ferrero Rocher, Lindt, guylian, maltesers, Rolos and much more! The Sweet Creations team make a large variety of bespoke sweet trees from as small as a 15cm to as large as 6ft tall sweet trees. 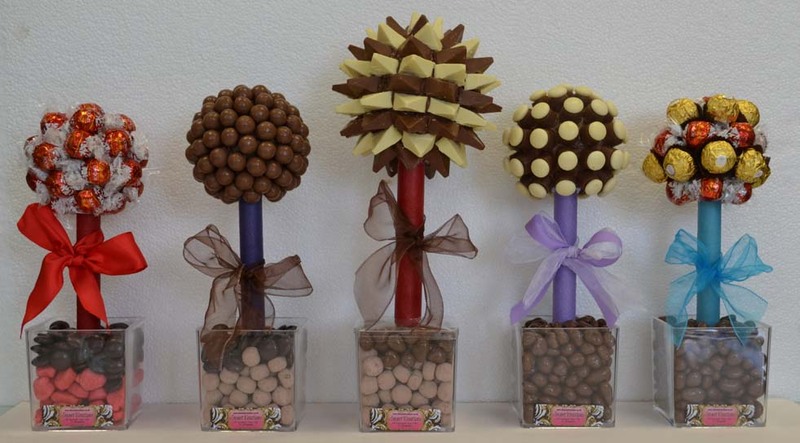 When ordering our sweet trees a small gift size sweet tree would be 30cm to £40cm. If you wanted to use the sweet trees as a centrepiece then we have a large selection available to just click and buy. If you just want an extravagant gift most of our clients purchase the 45-50cm tall sweet trees. We also create bespoke micro sweet trees and hand-held sweet trees as place settings with your guests personalised name. These can be made for you dinner table for special occasions or for Christmas. If you would like a luxury going home gift for your party we provide a variety of different sweet trees gifts or beautifully gift wrapped bags of sweet and chocolate. If you would like us to personalise your sweet trees please contact the office. There is no minimum order to personalise anything. We can also use your company logo on the trees, base or poles. We can use your logo on stickers, ribbons, labels, sticks and many more. Sweet creations also provide promotional branded gifts. If you just want something unique then let us know your requirements and we can make almost any chocolate or sweet tree. The sweet trees can be made in just one single colour such as all pink, blue, red etc. Sweet Trees have become a must have centrepiece at Corporate Events, Weddings, Bar/Bat Mitzvahs, Parties, Themed Parties, Award Ceremonies & Celebrity Parties, christenings. Even various Royal families have enjoyed our sweet trees. We offer a fabulous efficient service where we deliver and set the sweet trees up at your venue, then come back and collect the empty vases. This is subject to an extra charge. We can hand deliver to many places over the UK. Every year Sweet Creations designs and creates a new range of sweet trees for Valentines, Mother's Day, Easter, Father's Day, Halloween and Christmas. Sweet Creations also provide outrageous creations. We create 6ft tall sweet trees to walls of sweets, cars, plaques, lipsticks and much much more. Our prices for our outrageous creation start from £250 up to £5000. All our sweet trees can be made bespoke to many dietary requirements including vegetarian, kosher, halal, dairy free or Gluten free. Our sweet tree Sweets/chocolates and colours can all be changed to suit your needs or just to your favourites. Our sweet trees can be made from almost any soft, hard or jelly sweets. If you are having a strictly kosher function and you need your sweet trees to be certified under the Beth Din then we can also help you with that. We work with a very large variety of kosher sweets and parev chocolate. Our sweet trees start from as little as £6.50 to enable everyone to indulge in them! You can view our gift sweet trees and buy as little as one or as many as you like. We have a fabulous large selection of gift sweet trees online and delivered to you door in just a few days. If you want a sweet tree delivered on a next day delivery just contact us in the office. These sweet trees are suitable for gifts as well as using them for centrepieces. All our sweet trees come beautifully wrapped in cellophane with coloured ribbons tied to the sweet trees. They come securely wrapped and boxed for them to transported by a courier company. Our sweet trees can be delivered all over the UK. We are able to deliver to some European counties for an extra delivery charge. We sell our sweet trees individually as well as large quantities. There is no limit to how little or how large your order is. In 2013 we introduced corporate companies to our sweet tree team building days. These have been a great success. We cater for small groups as well as very large groups in function rooms. The day is filled with fun and laughter and even better still get to keep you sweet tree creation. All our sweet trees & chocolate trees are all handmade with care. If you are interested in other designs of sweet trees have a look through our gallery or you are more than welcome to call the office, tell us your requirements to make your own bespoke sweet tree or arrangement. We can work with almost any budget. Please contact us here for more information I'm sure that we will be able to help make your occasion a special and memorable moment.